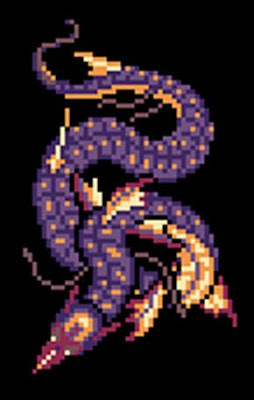 In playing the Nintendo DS remake of Final Fantasy IV and essentially reliving a game I first played through in 1993 — only now in considerably more visual detail with a few bells and whistles thrown in — I came across an optional, penultimate boss that I’d nearly forgotten about: Ogopogo. Little did I realize at the time that Ogopogo got his name when the people in charge of translating the original Super Nintendo version decided to throw a reference in to a Nessie-like sea serpent that supposedly lives in British Columbia. Unless I’m mistaken, Squaresoft’s American office would have been located in Washington at the time and therefore would have been a relatively short driving distance from Lake Okanagan. It seems likely enough that the translators would have heard the long-lived legend of this lake-dwelling cryptid and decided to dub the boss in its honor rather than using its awkward Japanese name, “Tidaliathan.” According to Wikipedia, Squaresoft even sent out a company newsletter for a period, and the name of it was the Ogopogo Examiner. When my family visited that very year I played through Final Fantasy IV, my little mind was blown away, however briefly, when we encountered a statue celebrating Ogopogo. He looked a lot nicer in statue form than he did in the video game, what with him killing me on many failed attempts to steal his treasure. I’m still not clear how to pronounce the creature’s name — flat, with no emphasis, “Oh-go-po-go”? or with the accent on the second syllable, “Oh-GOP-oh-go”? — but seeing him again was a nice way to remember something I’d nearly forgotten. Oh, and I totally killed him. That was nice too. 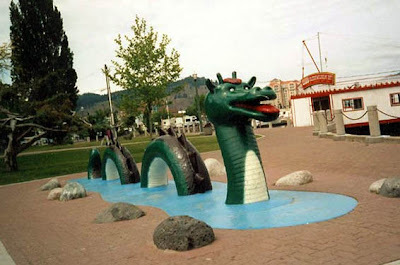 I actually grew up in the town of Kewlona, British Columbia where Ogopogo lives. She/he (depending on who you talk to) is a cousin of the Loch Ness Monster. The name comes from a Native tribe's word for "lake demon". It is pronounced flat, no emphasis... in America that is. In Canada, they tend to elongate the 'o' a little for the traditional Canadian accent. An just in case you're wondering, I do say 'eh' when I'm not thinking about not saying it. It's the price you pay for learning to speak in Canada. The common anglicized pronounciation of Ogopogo is with soft G's(as in "green") not hard J's(as in "Gee whiz"), long O's(as in "orange") not short O's(as in "omelette") and standard P's(as in "popcorn"). It's also pronounced with four syllables, spaced as you've done the first time: O-GO-PO-GO, and with the accent on the third syllable(or "po"). I'm sorry, not to contradict someone who grew up there, but i've never heard anyone pronounce the word Ogopogo "flat with no emphasis"...either in person or in larger media(ie: monster hunter shows on tv, etc), whether they're from canada or not...I just tried it "without emphasis" on any syllable and it sounds funny, like you're running out of breath, lol. However, that's the englishized version of it and I wouldn't know what the native term actually is or how it would be pronounced...or even which specific native language family that the term would come from: shuswap, etc(I think they overlap a bit in some of those areas). I'm of native descent myself, but from the coast and a different language; i could make a guess with further research, but off the top of my head I wouldn't be able make an attempt at a pronounciation which might be closer to the native word that "Ogopogo" originated from...but as far as the English pronounciation goes, that's as best as i know it. I'm from canada but absolutely nobody i know started pronouncing "elongated O's" with a "traditional canadian accent" in the manner that I think Kristin is referring to(ie: words like "aboot" for "about") until *after* South Park intentionally created that for their movie, lol; and even then, it was *because* of that movie that they adopted that mannerism as a tongue-in-cheek reference to itself! As far as I can tell, the creators of South Park got the idea for that speech mannerism from the man who was the Canadian Prime Minister at the time: Jean Chretien. Jean Chretien not only spoke English with a sharply distinct Quebecois-French accent, but also had a speech impediment caused by a stroke which severely affected any of his speech at all. I might be coming off as defensive here, for which I apologize, but it's a minor point of contention for me; basically, I don't assume that all Americans speak with George W. Bush's accent just based on hearing him speak alone, lol...and besides all that, I've also been told that, linguistically, there's more difference from east to west than there is north to south(but I don't have anything to reference that, unfortunately). Also, that whole "Eh" thing is something very similar; it was popularized by The McKenzie Brothers, Bob & Doug(or Dave Thomas & Rick Moranis) as part of their skits for the SCTV programming, but it hasn't been demonstrated or documented exactly how influential they were in *promoting* that "Canadian" style of speaking by doing so. I know that I've heard people from south of the border in Buffalo, MInnesota, etc. speaking with a *much* heavier "Canadian" accent than I've ever heard locally anywhere near where i grew up, and I've also grown up with people here locally who actually speak with a thick "gangsta thug" accent and yet they've never been anywhere near California, lol. But this in't the time or place for that kinda discussion, is it? Just food for thought...c'ya! Clarification appreciated. I'm certainly no expert on the pronunciation of Canadian words, but I appreciate the discussion nonetheless.